Back in January 2010 Tourism Minister Fadi Abboud told Future News television that Lebanon will respond to the Israeli challenge and will prepare a new plate of hummus in the spring, to break the Israeli world record for the biggest hummus plate. Yesterday Lebanon proved Abboud right … Lebanon on Saturday claimed another victory in the continuing battle with Israel over which country can make the largest plate of the chickpea delicacy hummus. The new plate broke all the Guinness record for the world’s largest plate of hummus. 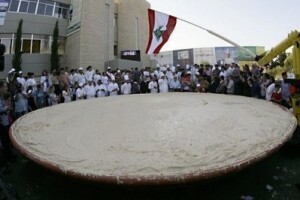 Lebanon on Saturday presented a 10452 Kg Hummus plate ( 1 kg per each square Km of Lebanon’s area). It took 8000 kg of boiled Hummus , 2 000 kg of Tahina , 2000 kg of Lemon and another 700 kg of olive oil to prepare the Hummus plate that broke all the records .